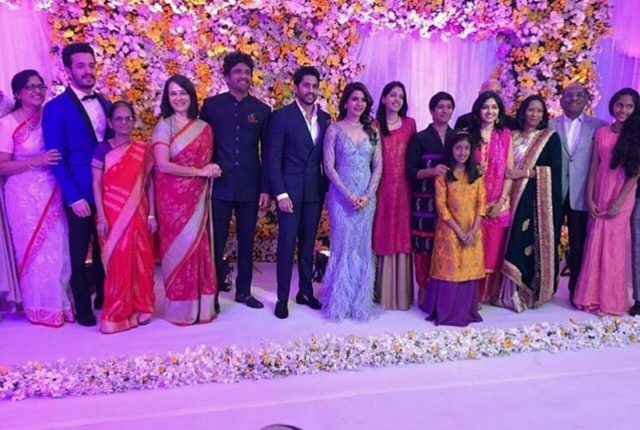 Naga Chaitanya and Samantha Akkineni tied the knot in October this year in a grand ceremony in Goa. The couple who met in 2010 on the sets of Ye Maaya Chesave got engaged last January. Nagarjuna has planned a reception for the couple in Hyderabad today and we have got our hands on the first photo from the event. Naga Chaitanya and Samantha Akkineni make for the perfect couple in this photo. Naga Chaitanya looks dapper in a suit whereas Samantha looks stunning in a gown. The event will be graced by film-stars, political big-wigs and business honchos from across the country. The couple had been honeymooning in England and Ireland but are now back in Hyderabad. “The couple wanted to avoid attention. Moreover, they don’t technically look at it as a honeymoon. It’s more of a post-wedding holiday for them, almost similar to a pre-wedding holiday they had. Except this is the first time they are doing so as man and wife. They plan to go to Scotland as well where they will check out historical spots. Ireland is on the cards too,” a source had told a leading daily. “The excited father-in-law Nagarjuna has got great plans for the duo. 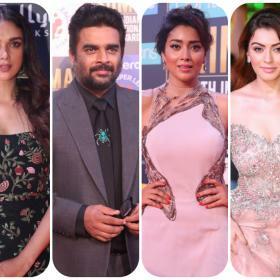 He has been busy planning a grand affair for the newlyweds and is said to be taking care of all the arrangements himself, with a little help from wife Amala. This has been a very exciting few days for the doting father who’s unable to believe how quickly things have happened,” a source had revealed to a leading daily earlier. Why can’t people just be happy for others. I’ve known her since school. Her parents requested not to share their pics. They are private people. Her parents attended all the events. Her brother walked her down the aisle. Stop judging others without getting the facts right. Lol you dont need to have an issue with your children’s profession, just cause you need privacy. Google sam’s parents pics, wedding pics and you’ll find them easily. Normally I would have thought just like you. I’ve seen her in school and I know her, just clarifying because I know the truth. I think she has some kind of strained relationship with her parents. You should be checking out the video in YouTube where her father talks about her during an income tax raid that they have no idea about her whereabouts! It sounded very strange to me. what’s so special about this? id respect them more if they had used this moeny to help someone poor. at least they would get some blessings to start their new life. entitled people, that don’t pay taxes and benefit from caste and other cronyism. Lol so u save every penny, never waste money and do charity is it? Where are her parents? Didn’t see any pics of them at the wedding or reception here.